potato nuggets recipe | spicy potato nuggets | potato snacks recipes with detailed photo and video recipe. 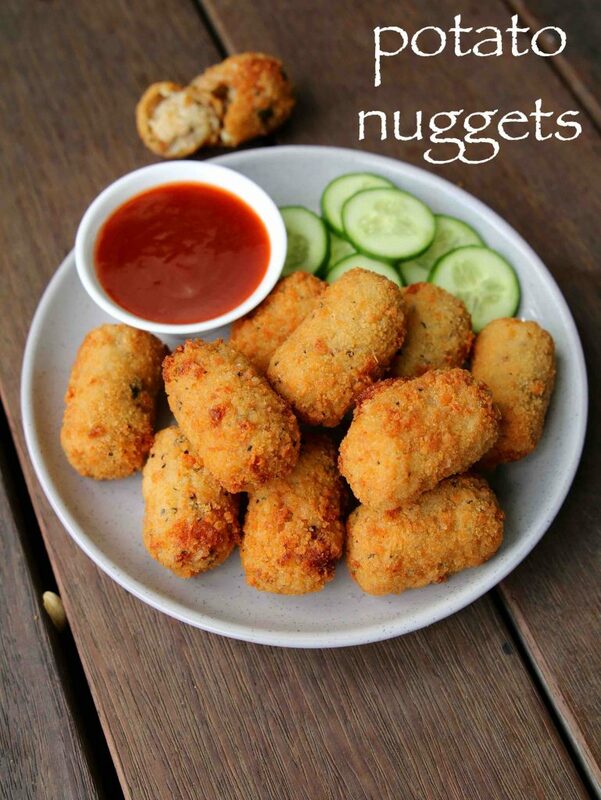 basically a vegetarian version of the popular chicken nuggets for non meat eaters. 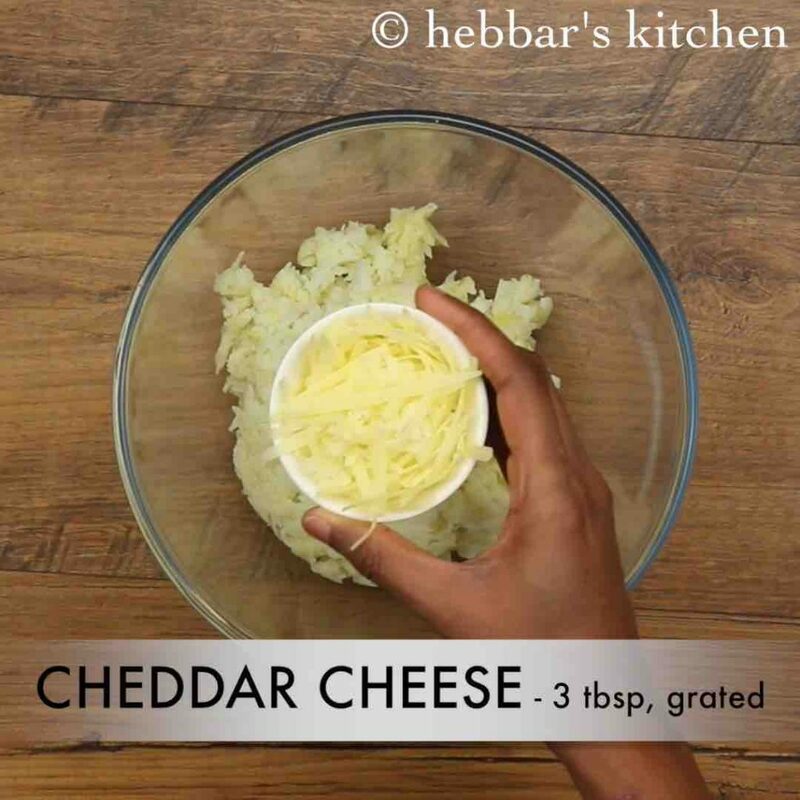 the recipe for these nuggets are simple and is prepared with the combination of cheese and mashed potatoes coated with breadcrumbs. in addition these nuggets are ideal kids snacks recipes or tiffin box recipes. 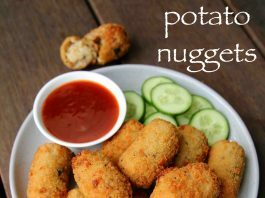 potato nuggets recipe | spicy potato nuggets | potato snacks recipes with step by step photo and video recipe. nuggets are popular snacks recipe served in many fast food chain today but the original recipe was chicken McNuggets started by McDonald’s. it was a huge hit and hence later the recipe was adopted by many food chains with varieties of ingredients. spicy potato nuggets are one such adaptation and are huge success in india. 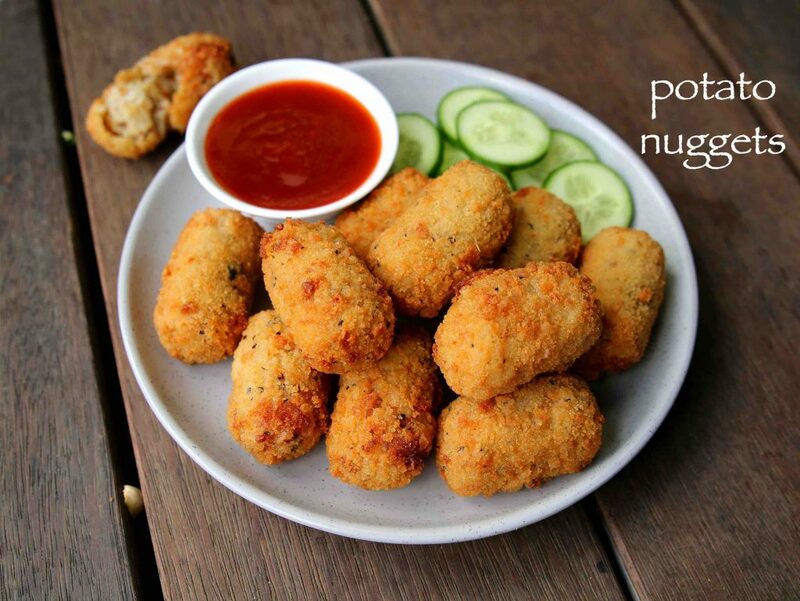 as mentioned, potato nuggets are inspired recipe version from meat counterpart but even with vegetarian, there are several versions and variations. the popular one is spicy potato nuggets, but the other varieties like lentil nuggets, paneer nuggets or veg nuggets are equally popular. 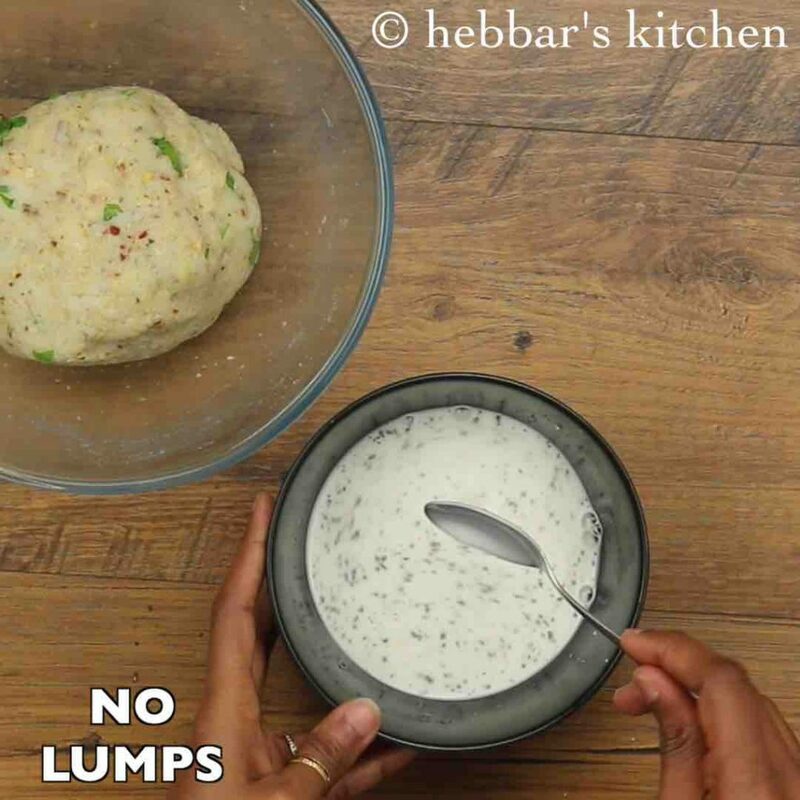 apart from eating these as snacks or starters, it can also be filled within roti’s or chapathi’s with a choice of sauce and can be served as wraps or rolls. i personally love it when mix and matched with paneer tikka or mushroom tikka and rolled / wrapped with a leftover chapathi / roti. having said that it tastes great when served as it is with plain tomato ketchup or eggless mayonnaise. 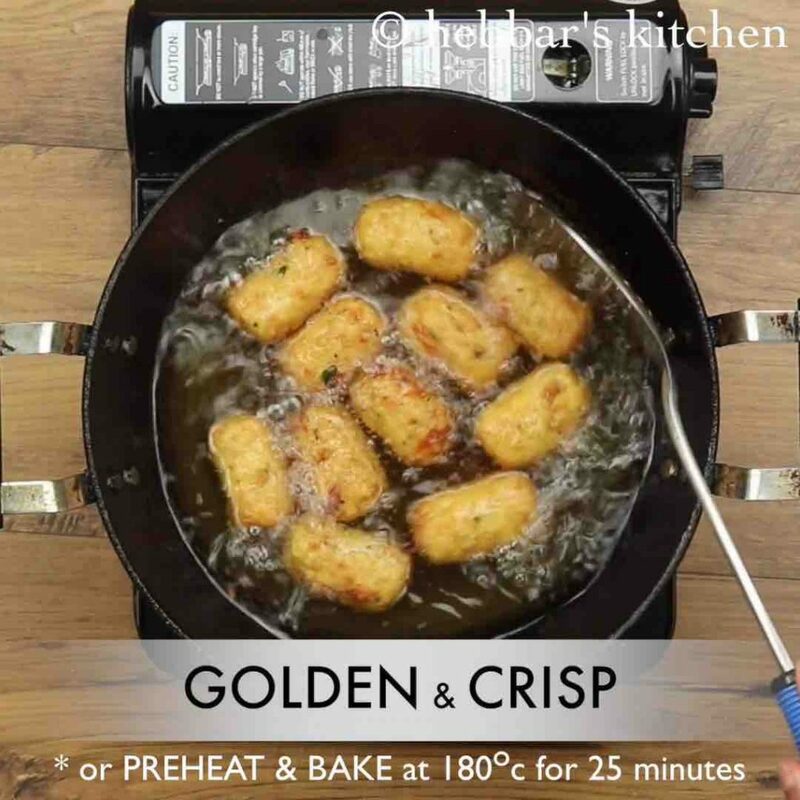 i would like to share some basic tips and suggestions for a perfect crisp spicy potato nuggets recipe. firstly, and more importantly after the potatoes are boiled, make sure it contains less moisture. basically this would help to shape the nuggets and also consumes less oil. secondly, the recipe can be easily extended to add more vegetables with potatoes. 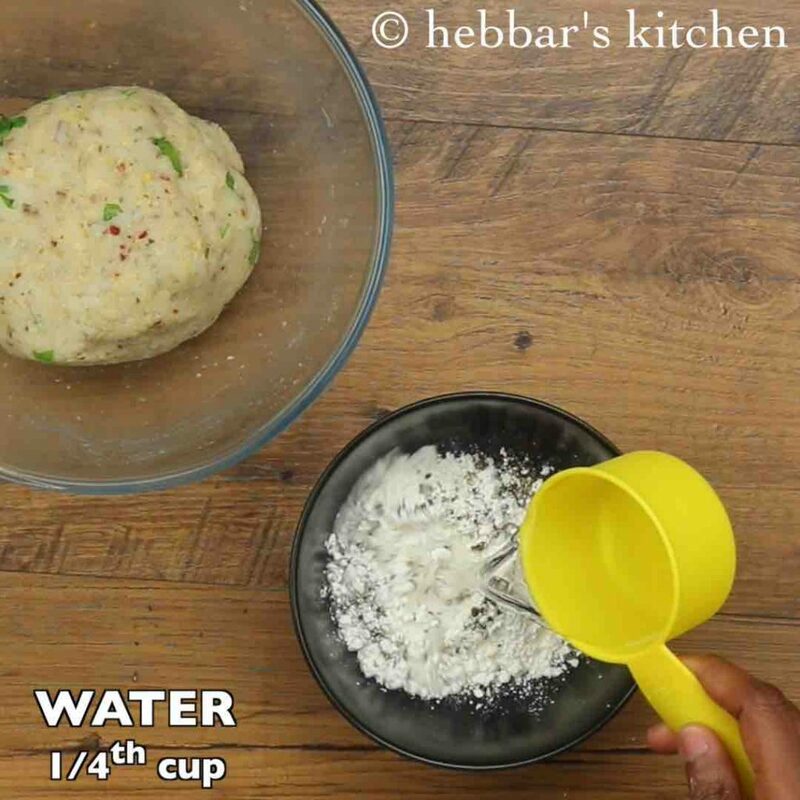 for instance, you can add boiled peas, corn, carrots, beans and cauliflower to make it veg nuggets or veggie nuggets recipe. lastly, i have deep fried these nuggets till golden crisp with panco breadcrumbs. alternatively these can also be pan fried or even baked with corn crumbs or even powdered rusk. you should be good to bake in a preheated oven at 180 degrees for 25-30 minutes. make sure to rotate these on a regular interval if you are baking it in conventional oven. 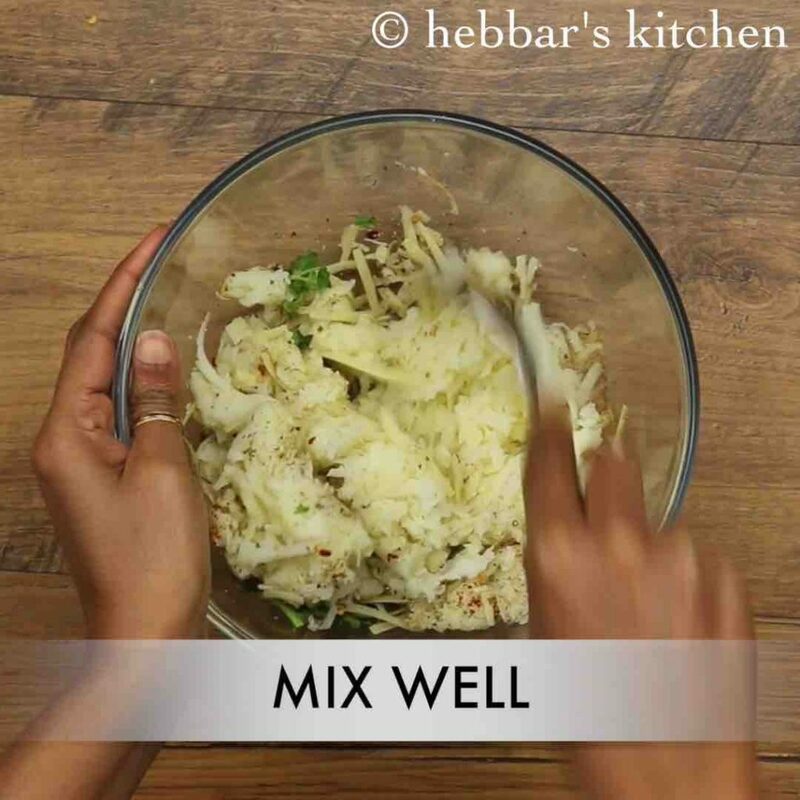 firstly, in a large mixing bowl take 2 potato, 3 tbsp cheddar cheese, ½ tsp ginger garlic paste, ½ tsp chilli flakes, ½ tsp mixed herbs, ¼ tsp pepper, ½ tsp chaat masala, ¼ tsp salt and 2 tbsp coriander leaves. 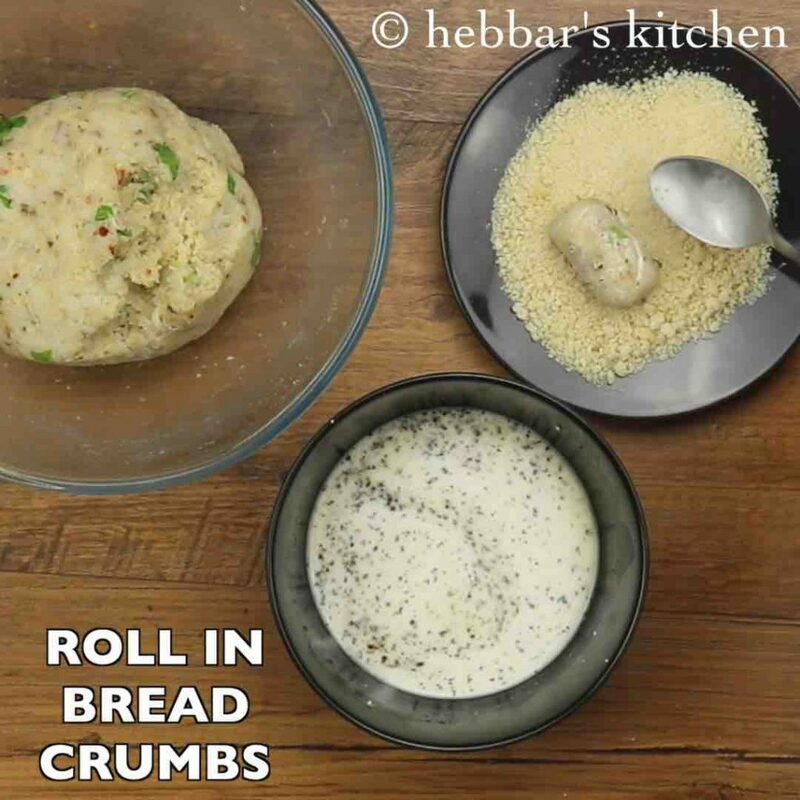 now add ¼ cup bread crumbs and combine well. 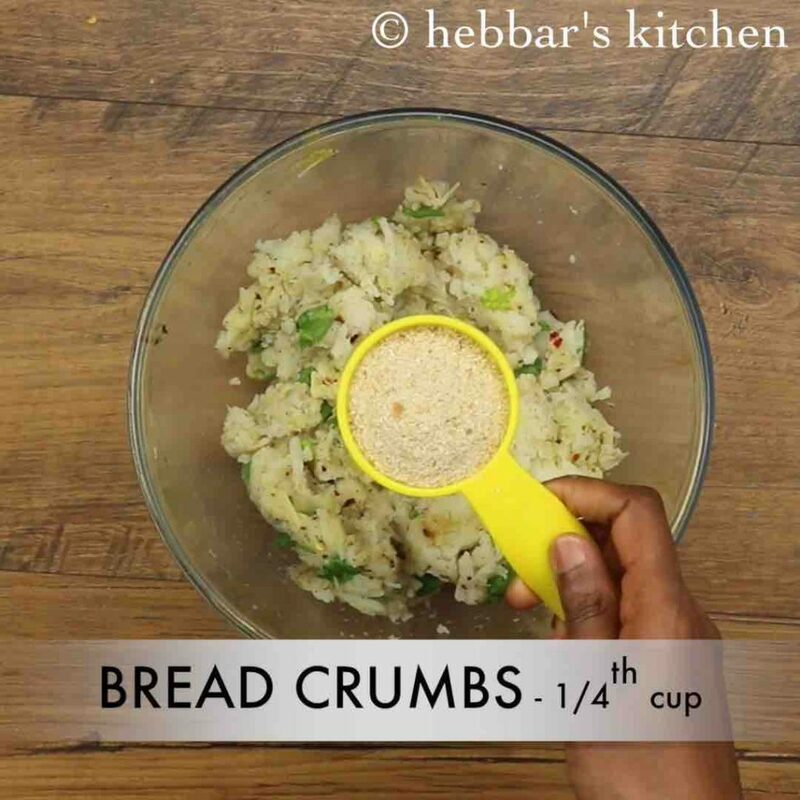 breadcrumbs helps to absorb moisture and prevent from breaking in oil. 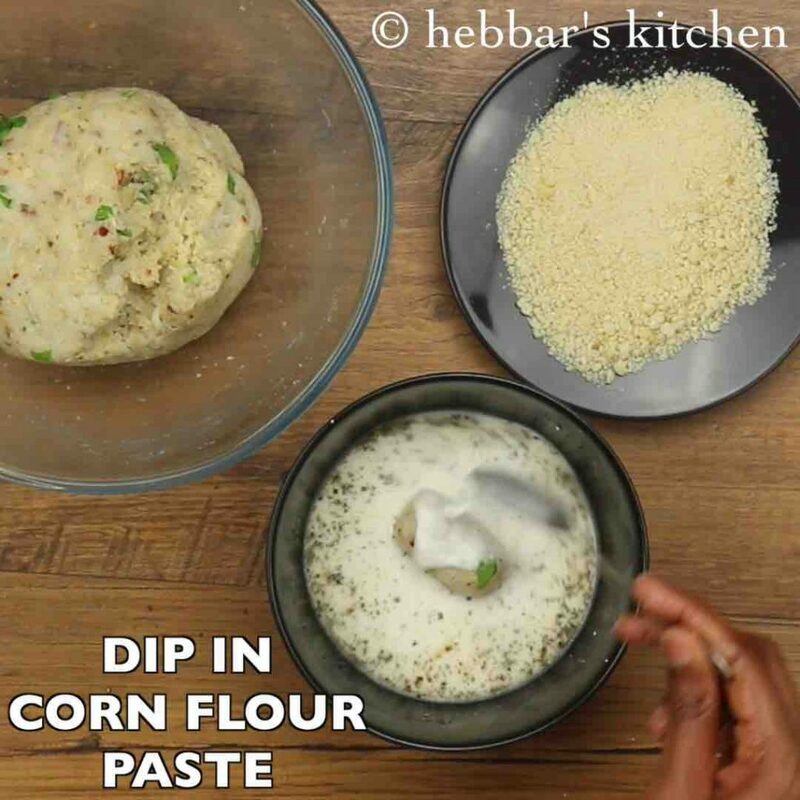 further prepare corn flour batter by mixing ¼ cup corn flour, ¼ tsp pepper, ¼ tsp salt and ¼ cup water. prepare a smooth flowing consistency batter. 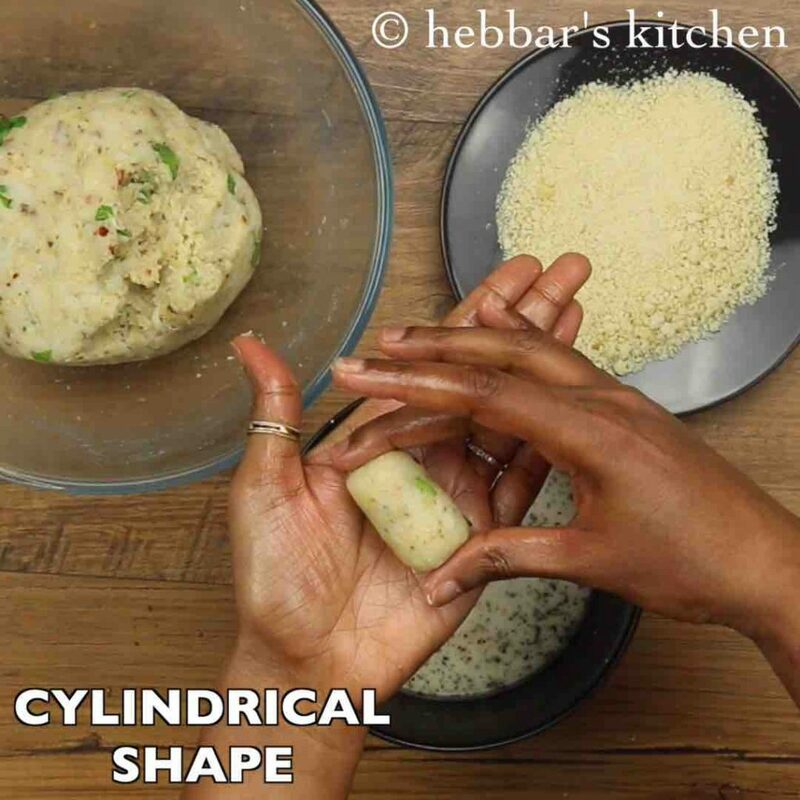 pinch a small ball sized potato dough and roll to cylindrical shape. dip in corn flour batter covering all sides. 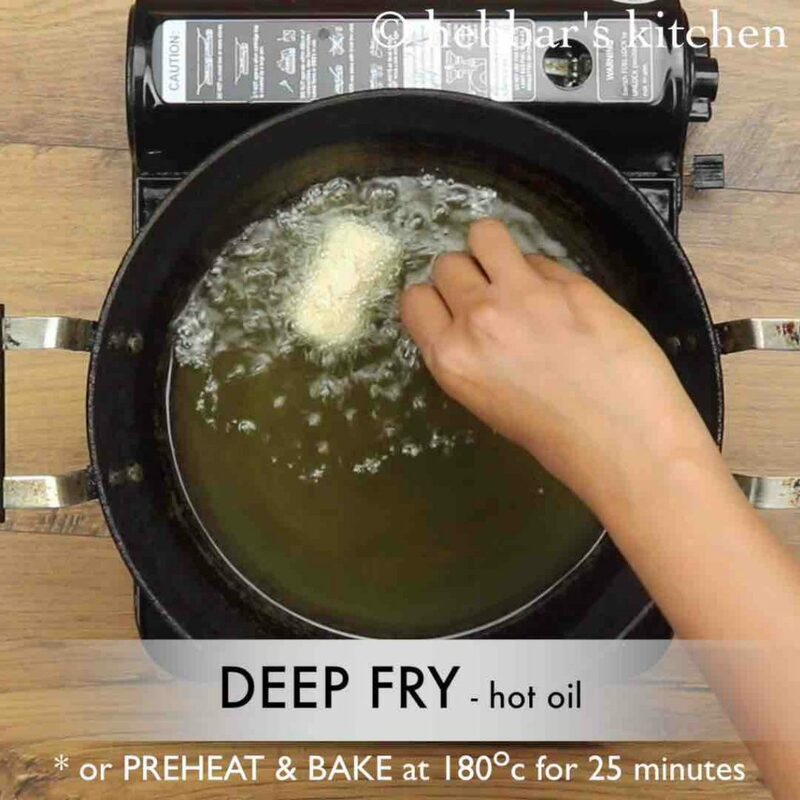 deep fry, shallow fry or pan fry the patties in hot oil. alternatively, preheat and bake at 180 degree celsius for 25 minutes. finally, drain over kitchen paper to remove excess oil and serve potato nuggets with tomato sauce. firstly, grate the boiled potato and do not mash in hand as there will be lumps left out. also do not compensate in adding spices, else the nuggets will just taste bland. additionally, add boiled and mashed vegetables like peas, beans and carrot to make it more nutritious. finally, potato nuggets can be served as a sides with veg burger. I tried your momo, kulcha, rasam, potato wedges and bread dosa. Tastiest and easiest recipes. Thanks a lot for your work.